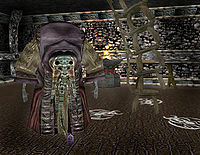 Dagoth Ulen is an Ascended Sleeper, who can be found at the Sixth House base of Kogoruhn, in the Vault of Aerode. He is one of the few Ascended Sleepers capable of speech, though you'll need to sneak up on him or cast Calm in order to talk to him. Greeting 1 — Look! It's Azura's Fool! Look at you. Not a real thing at all. Just a pathetic puppet of prophecy. And you think you can trust the Daedra Lords? Greeting 2 — Come on! You're the prophesied Incarnate! Azura has promised you fame and glory! Surely you can't be afraid of me, can you? Don't be shy. With a Daedra Lord for ally and patron, how could you lose? Oh, PLEASE don't hurt me, star-blessed hero! Topic: "Azura's Fool" — Ah, she's sucked you in with her pretty prophecies. Promised you power, did she? Promised you justice, did she? And when did a Daedra Lord ever fulfill a promise? Such a faulty memory you have. Topic: "Daedra Lords" — Mortals are but simple sport to the Daedra Lords. They pull the strings, and you poor fools leap and dance. Why do you serve them? Why do you fall for their honeyed lies? For ages you've yielded to their temptations, their false promises. How soon you forget their treachery, their deceits.